Locate Brake release at underside of secondary worksurface. Pull the brake release while holding the secondary worksurface then adjust secondary worksurface up / down, release the brake to lock position. 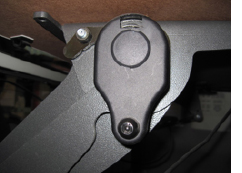 Remove the adjustment access cover by prying the snap in covers with a screwdriver. Place the 9/16” socket over the hex spring hub and pull the wrench towards the front of the worksurface to increase spring tension. 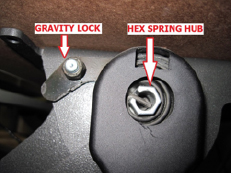 The gravity fed spring lock will click into the next available position. 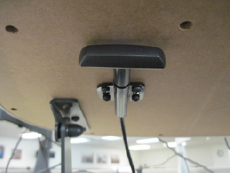 Adjust both springs equally to counterbalance the adjustable worksurface with an appropriate amount of spring lift. When the appropriate counterbalance is achieved snap the adjustment access cover back over the access hole. Place the 9/16” socket over the hex spring hub turn as if to increase the setting, this releases the spring lock. Pull the gravity fed spring lock with one hand and slowly turn the socket towards the rear of the worksurface to unwind the spring tension completely with the other. CAUTION: The spring is under significant force to unwind. Loosen star knob on right side dual arm while holding the secondary worksurface. Adjust the tilt of the secondary worksurface and then re-tighten the knob.